The United States Mint sent the following image of the 2010-P Mount Hood 5 Ounce Silver Uncirculated Coin within an e-mail to customers promoting the coin’s release. The fifth and final 2010-dated coin in the America the Beautiful Five Ounce Silver Uncirculated Coin series launched Thursday, July 28, 2011 at noon Eastern Time. 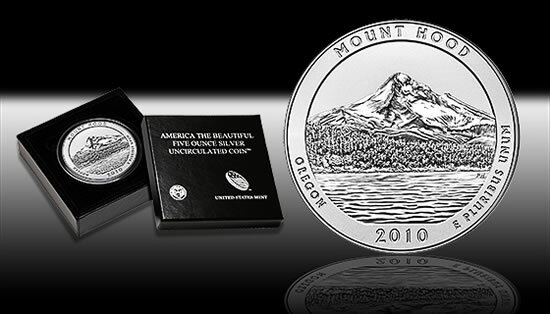 The United States Mint released the 2010-P Mount Hood National Forest Five Ounce Silver Uncirculated Coin for $279.95, the same price as the previous four issues. The collector piece celebrates the national forest located in the state of Oregon, which is just one of the fifty-six national sites the America the Beautiful coin series will honor through the years. Buyers can place an order directly from the United States Mint website at http://www.usmint.gov/catalog or by calling the bureau directly at 1-800-USA-MINT (872-6468). There is a one unit per household limit and each domestic order will be charged a shipping and handling fee of $4.95. The Mint is expected to begin shipping orders by August 11, 2011. Composed of five ounces of .999 fine silver, the collector Mount Hood silver coin boasts a massive diameter of 3.0 inches and a thickness of 0.16 inches which is tall enough to bear the edge letterings of .999 FINE SILVER 5.0 OUNCE. Its edge is a main difference, as well as its obvious size and composition, to the circulating Mount Hood National Forest Quarter. Both coins share the same obverse ("heads") and reverse ("tails") designs, down to the QUARTER DOLLAR inscription. The quarter, which was released in November, has a reeded edge. "These striking numismatic collectibles are produced with an uncirculated finish and display a ‘P’ mint mark for the United States Mint at Philadelphia, where they are struck," the United States Mint product page for the strike describes. "The coins are encapsulated, set in a protective outer box, and accompanied by a Certificate of Authenticity. These coins are produced in limited quantities and demand is expected to be great." Designed and engraved by Phebe Hemphill, the coin’s reverse or tails side showcases a scene of Lost Lake and Mount Hood, the home of twelve glaciers. The obverse bears John Flanagan’s 1932 portrait of George Washington. All five of the 2010-dated collector coins were produced entirely in 2010 but launched in 2011. Each uncirculated coin has a mintage of 27,000. The first three sold out and the fourth is well on its way, currently just 4,215 short of a sellout. The five ounce series has received extra attention during the last few days. Several incidents of errors and varieties have been reported with the uncirculated coin finishes, which could be favorable for Mount Hood coin sales. The United States Mint released a statement on the subject just one day ago. The United States Mint has already released five ounce bullion versions of each of the ten sites listed above. The bullion coins are intended for investors as they do not have the finish of the uncirculated coin and they lack the ‘P’ mintmark. Designated on September 28, 1893 by the government, the beautiful and pristine area now known as Mount Hood National Forest has evolved into a popular recreation spot. The forest stretches over one million acres in north-central Oregon, not far from the city of Portland. Mount Hood itself provides a great place for snow skiing, while the Columbia River Gorge, Multnomah Falls, and several hot springs supply beautiful backdrops for picnicking, camping, and hiking. Visit http://www.fs.usda.gov/mthood for more information.